The Brusilov Offensive (Russian: Брусиловский прорыв Brusilovskiĭ proryv), also known as the June Advance, was the Russian Empire's greatest feat of arms during World War I, and among the most lethal battles in world history. Professor Graydon A. Tunstall of the University of South Florida called the Brusilov Offensive of 1916 the worst crisis of World War I for Austria-Hungary and the Triple Entente's greatest victory. It was a major offensive against the armies of the Central Powers on the Eastern Front, launched on June 4, 1916 and lasting until early August. It took place in what today is Ukraine, in the general vicinity of the towns of Lemberg, Kovel, and Lutsk. The offensive was named after the Russian commander in charge of the Southwestern Front, Aleksei Brusilov. Early in 1916 France called upon Russia to help relieve the pressure on Verdun by launching an offensive against the Germans on the Eastern Front, hoping Germany would transfer more units to the East to cope with the Russian attack. The Russians responded by initiating the disastrous Lake Naroch Offensive in the Vilno area, during which the Germans suffered just 1/5 as many casualties as the Russians. General Aleksei Brusilov presented his plan to Stavka, the Russian high command, proposing a massive offensive by his Southwestern Front against the Austro-Hungarian forces in Galicia. The main purpose of Brusilov's operation was to take some of the pressure off French and British armies in France and the Italian Army along the Isonzo Front, and if possible, to knock Austria-Hungary out of the War. General Alexei Evert, commander of the Russian Western Army Group, favoured a defensive strategy and was opposed to Brusilov's offensive. Tsar Nicholas II had taken personal command of the army in 1915. Evert was a strong supporter of Nicholas and the Romanovs, but the Tsar approved Brusilov's plan. The objectives were to be the cities of Kovel and Lemberg which had been lost to the Central Powers in the previous year. Although Stavka had approved Brusilov's plan, his request for supporting offensives by neighboring fronts was effectively denied. Mounting pressure from the western Allies caused the Russians to hurry their preparations. Brusilov amassed four armies totaling 40 infantry divisions and 15 cavalry divisions. He faced 39 Austrian infantry divisions and 10 cavalry divisions formed in a row of three defensive lines, although later German reinforcements were brought up. Brusilov knowing he would not receive significant reinforcements moved his reserves up to the front line. He used his reserves to dig entrenchments about 300 meters long and 90 meters wide all along the front line. These provided shelter for the troops and hindered observation by the Austrians. The Russians secretly crept to within 100 yards (91 m) of the Austrian lines and at some points as close as 75 yards (69 m). Brusilov prepared for a surprise assault along a 300-mile (480 km) front. The Stavka urged Brusilov to considerably shorten his attacking front to allow for a much heavier concentration of Russian troops. 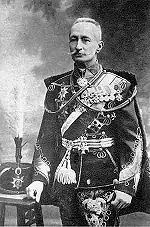 Brusilov, however, insisted on his plan and the Stavka relented. On June 4, the Russians opened the offensive with a massive, accurate, but brief artillery barrage against the Austro-Hungarian lines. The key point of this was the brevity and accuracy of the bombardment, in marked contrast to the customary protracted barrages of the day which gave the defenders time to bring up reserves and evacuate forward trenches, and damaged the battlefield so badly that it was hard for the attackers to advance. The initial attack was successful and the Austro-Hungarian lines were broken, enabling three of Brusilov's four armies to advance on a wide front (see: Battle of Kostiuchnx�wka). The success of the breakthrough was helped in large part by Brusilov's innovation of shock troops to attack weak points along the Austrian lines to effect a breakthrough which the main Russian Army could then exploit. Brusilov's tactical innovations laid the foundation for the German infiltration tactics (also called Hutier tactics) used later in the Western Front. In a meeting held on the same day Lutsk fell, German Chief of Staff Erich von Falkenhayn persuaded his Austrian counterpart Franz Conrad von Hx�tzendorf to pull troops away from the Italian Front to counter the Russians in Galicia. Field Marshal Paul von Hindenburg, Germany's commander in the East (Oberkommando-Ost), was again able to capitalize on good railroads to bring German reinforcements to the front. On 18 June 1916, an article "Hero of the Hour in Russia, Described Intimately by One Who Knows Him Well" by Brusilov's brother-in-law, Charles Johnson, appeared in the New York Times. Brusilov's operation achieved the original goal of forcing Germany to halt its attack on Verdun and transfer considerable forces to the East. It also broke the back of the Austro-Hungarian Army which lost nearly 1.5 million men (including 400,000 prisoners). The Austro-Hungarian Army was never able to mount a successful attack from this point onward. Instead it had to rely on the German Army for its military successes. The early success of the offensive convinced Romania to enter the war on the side of the Entente, though with disastrous consequences. Russian casualties were also considerable, numbering around half a million. The Brusilov Offensive is listed among the most lethal battles in world history. 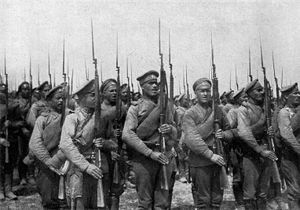 The Brusilov Offensive was the high point of the Russian effort during World War I, and was a rare manifestation of good leadership and planning on the part of the Imperial Russian Army. Thereafter the effectiveness of the Russian Army started to decline, due to the deteriorating economic and political situation on the home front, which the army's heavy casualties did nothing to alleviate. Even whilst the Germans and the Austro-Hungarians were being pushed back along their front line, at least 58,016 Russian soldiers deserted. This was only a premonition for things to come when the balance was in Germany's favour. The operation was marked by a considerable improvement in the quality of Russian tactics. Brusilov used smaller specialized units of soldiers to attack weak points in the Austro-Hungarian trench lines and blow open holes for the rest of the Russian Army to advance into. These shock tactics were a remarkable departure from the "human wave" tactics that were prevalent until that point during World War I by all the major armies at the time. The irony was that the Russians themselves did not realize the potential of the tactics Brusilov produced. It would be Germany that seized on the model and utilized "storm troopers" to great effect in the 1918 offensive on the Western Front, which was hastily copied and used to an even greater effect by the Western Allies. Shock tactics would later play a large role as well in the early German blitzkrieg offensives of World War II and the later attacks by the Soviet Union and the Western Allies to defeat Germany, and would continue until the Korean War and the First Indochinese War, which ended the era of the mass-Trench warfare in all but a few nations, mostly in Africa. Liddell Hart, B.H. The Real War: 1914-18 (1930), pp. 224-227. Schindler J. "Steamrollered in Galicia: The Austro-Hungarian Army and the Brusilov Offensive, 1916", War in History, Vol. 10, No. 1. (2003), pp. 27-59.